Already in ancient Rome there were many public squares that offered fountains with free drinking water. The fact that this wasn’t a luxury rather a necessity in the city’s hot Mediterranean climate is made very clear, to those who have ever visited Rome in the months of July or August. The water for these public fountains did not come from the river Tiber – its water was already too dirty for the ancient Romans. As there are only few natural water sources in the city, fresh spring water from the mountains was directed towards the metropolis over large distances by means of so called aqueducts. Consequently the water was able to span such great distances powered entirely by gravity and without the use of additional pumps. The aqueducts thus ran through hills and deep valleys – which till today still remains a masterpiece of engineering. At the end of the aqueducts in the city, large public fountains were often built. At the endpoint of the ancient ‘Aqua Vergine’ aqueduct for example, stands the most famous, beautiful and largest fountain in Rome – and perhaps even the world; the famous ‘Fontana di Trevi’ – the Trevi Fountain. This fountain has often served as a film setting. The current fountain is in a baroque style and was completed somewhere around the middle of the 18th Century. The fountain is 26m high and 20m wide; its architect cleverly designed the fountain so that a part of it is integrated into the façade of the adjacent Palazzo Poli. The ensemble is embellished with a triumphal arch and a statue of the ‘sea-god’- Neptune as well as other sea-related figures and allegorical representations. The Trevi Fountain is not just so popular for its artistic design, rather also because of a beautiful tradition that is associated with it. Legend has it that one will surely return to Rome if one throws a coin over one’s right shoulder into the fountain. If one throws two coins then one will fall in love with a Roman. If one throws three coins then one will marry this lover. This lovely legendary folk tale is still alive today – which can be seen by the considerable number of coins that lie in the shallow basin. 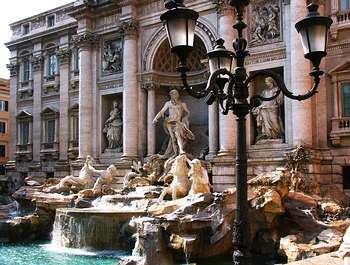 It is estimated that the Trevi-Fountain brings Rome annual revenue of at least 200,000 Euros.